What to get Dad for Father’s Day… The holiday is sometimes lost behind the commercial success of Mother’s Day. There seems to be no end of Mother’s Day gift ideas- in fact we’re pretty much inundated with suggestions from jewelry stores, florists, restaurants and candy stores. We have endless ideas for ways to pamper Mom on her special day and rightly so. Moms are special; they’re full of love and nurturing to their very core. Why would we not want to make Mother’s Day a reflection of our appreciation for Mom? Personalized gifts are a perfect way to show how much Dad means to you. Here are couple ideas of a gift that might just brighten your Dad’s special day. 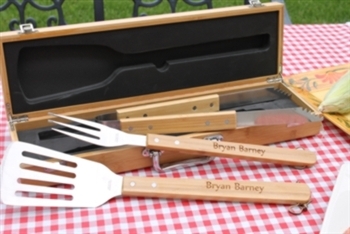 Summer just seems to bring out the chef in all of us – and if your dad loves grilling, this is a fantastic personalized and high quality gift to help him hone his outdoor cooking skills. 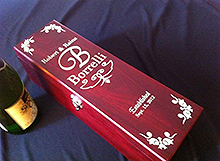 These decorative bottle stoppers are a great keepsake gift that will help dad remember you everytime you pours wine for a special occasion. Tell your dad how important he is to you with a beautiful personally inscribed wood plaque No more last minute ugly ties. This year get your dad a gift that tells him how much you love and admire him and how appreciative you are of his influence in your life.